When looking at the Tokyo ramen landscape you might see that a majority of restaurants serve either a light chicken based broth or a thick pork bone based broth for their ramen. Most ramen franchises and chain restaurants serve either of the two as the ingredients for these two soup broths are significantly cheaper than making something like a Toripaitan or a Niboshi heavy broth. That’s not to say that the quality of the ramen is bad, but that, as a business stand point, you stand to make a higher profit margin if you decide on these two broth bases. There are a number of ramen restaurants that I have already reviewed that serve high quality ramen because of their use of high quality ingredients that make their soup stand out among the crowd. However, when I do see a Niboshi heavy ramen restaurant, I get pretty excited as it has become a rarity in Tokyo. 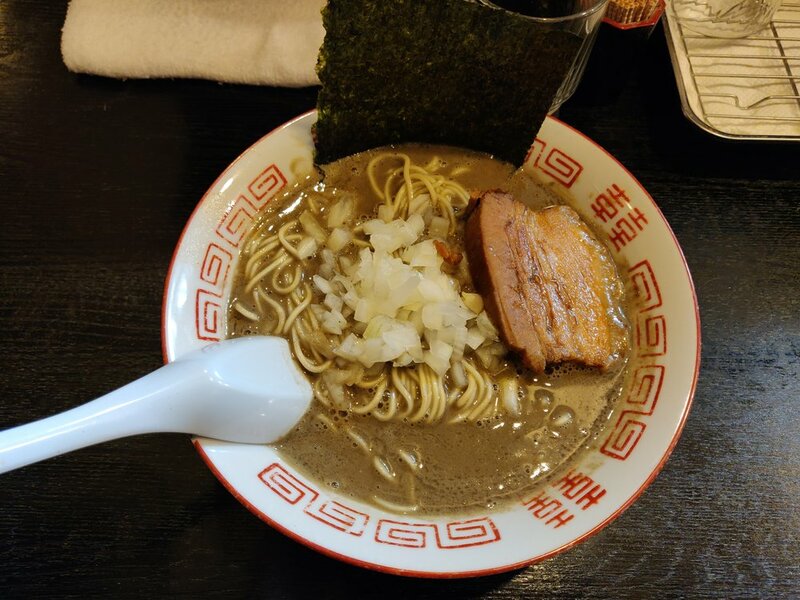 One ramen shop that has utilized this Niboshi heavy soup is Chuka Soba Ibuki, who only makes about 100-250 bowls per day becomes of the sheer amount of Niboshi needed to make their soup. What results however is the thickest, most dense Niboshi based ramen I have ever had and my early favorite for best bowl of ramen of 2019. The restaurant itself is quite far from central Tokyo located near Shimura Sakaue station which is about 40 minutes from Shinjuku on the Tokyo Metro lines. Once you get to the station, you need to walk five minutes or so south towards the mall and you’ll find Ibuki located right next to a huge park. An important thing to remember before coming to Ibuki is to check in on their twitter the morning of to make sure they are operating that day, and to check how many bowls they will be serving. Ibuki’s twitter is https://twitter.com/ibkkasu. They update their twitter throughout their lunch and dinner hours to let customers know if bowls are still available so if you don’t get there before they open, you’ll at least know if any is available before making your way there. During lunch, they serve a regular Chuka Soba with a Niboshi broth and at night serve a Tanrei (light) and Nokou (thick) Chuka Soba. Sometimes they may have a specialty menu item during lunch, but again, be sure to check their twitter for information regarding their menu items. 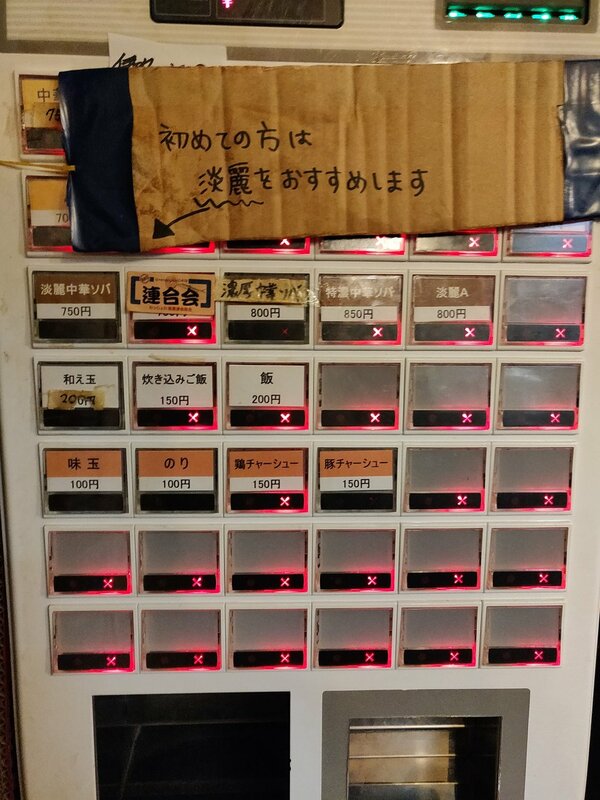 Much like most ramen shop, you’ll have to buy your ticket at the machine in the left corner. During the evenings they recommend you purchase the Tanrei Chuka Soba (端麗中華ソバ) as the Noukou Chuka Soba (濃厚中華ソバ) is quite intense for first timers. For lunch you have the option of the Chuka Soba (中華ソバ) or the specialty item if available that day. I highly recommend the regular Chuka Soba for lunch and the Tanrei during the evenings for first timers, and especially so if you have never had a thick, Niboshi ramen before. Its quite a unique flavor and can sometimes be a bit too much to handle if you’re not used to or enjoy fish broths. Side menu items are available on the first of the two bottom rows on the machines and are the Kaedama (extra noodles), Takikomigohan (rice with toppings), and Gohan (regular rice). The row below is the toppings of Ajitama (soft boiled egg), Nori (seaweed), Tori Char Siu (chicken char siu), and Buta Char Siu (pork char siu). As for the side menu, I recommend getting the Kaedama, or extra noodles, and tag on the Ajitama, or soft boiled egg, as an extra topping. The x indicates they are sold out, or not serving the item that day. Once you have your tickets purchased, take a seat at the counter and hand your tickets to the chef. He’ll take your ramen ticket, but leave your Kaedama ticket on the counter. When you’re ready for your second serving of noodles, just hand the ticket over to him. At your seat you’ll see a bottle of fish sauce and shoyu tare. Those are for the extra noodles later so enjoy your bowl as is for now. As you can see from the photo, the soup is incredibly thick and dense because the soup is made through an arduous process of simmering hundreds of pounds of Niboshi (dried sardines). When you walk in to the shop you can actually see the insane number of boxes of Niboshi they have stocked for their soup. The bowl is topped with a thick slice of pork char siu, handful of diced onions, and a single piece of dried seaweed. I opted for the Noukou Chuka Soba and started with the soup. The amount of umami flavor you get because of the sheer amount of Niboshi they use is incredible. As I’ve said before, the soup is incredibly thick and dense. It is almost like drinking a cream soup because of how thick it is. There is a good amount of bitterness as well as a fishy aftertaste to the bowl, but if you enjoy that type of soup, I can guarantee you’ll be addicted to the ramen here. The pork char siu here is also fantastic and is thick and meaty. It has a great bite to it with a slightly stronger shoyu flavor to combat the fishiness of the soup. The onions add a nice refreshing bite that cuts through the denseness of the soup and works well with the bowl. Noodles are traditional, straight noodles cooked al dente. As the soup is quite thick and dense, you don’t want too much at once and so the noodles are the perfect shape so that you’re not getting a gulp of soup with every bite. Once you’re done with the noodles, ask for the Kaedama, or extra noodles, if you ordered it. You can order it afterwards as well, just let them know and purchase your ticket at the machine. It does take a bit of time though so I recommend purchasing the ticket ahead of time, that way they’re prepared to make it for you once they see your noodles are almost finished. 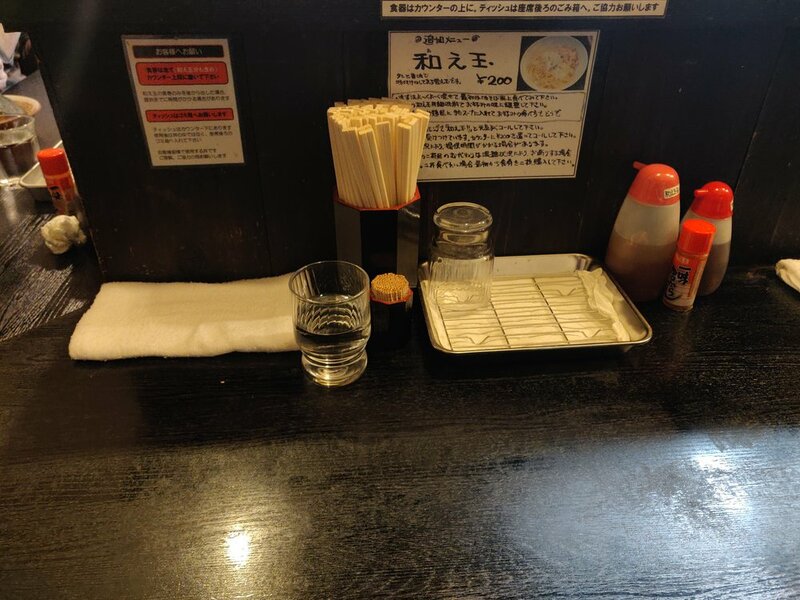 If you’ve ever been to places like Ramen Koike, you might already know, but there is a process to eating their extra noodles. The extra noodles comes with a bit of sauce already poured on and some onions, and shredded pork. You want to mix it all together and have a few bites to enjoy the flavor of the sauce before it mixes with the soup. The sauce is a condensed version of their tare and is the same as their specialty Maze Soba, or no soup ramen, that they occasionally have. It’s nice to have a slight flavor change from the Niboshi soup so it is quite enjoyable like this at first. Next you want to add some of the aforementioned fish sauce and shoyu tare if it lacks a bit of salty, savoriness. Add with caution however as both are condensed and can make it quite salty if you add too much. Once you’ve enjoyed it with the extra sauce, throw it in to your remaining soup and enjoy the rest of your meal. While this place is definitely not for everyone, for those who enjoy a bit of fishy ramen, this will definitely hit the spot. For me, this is exactly up my alley and it’s probably the best, thick Niboshi ramen I have ever had. If you want to try something different than the typical chicken broth or tonkotsu ramen you might find in central Tokyo, make your way to Ibuki. At least you’ll be able to expand your ramen experience if you do.